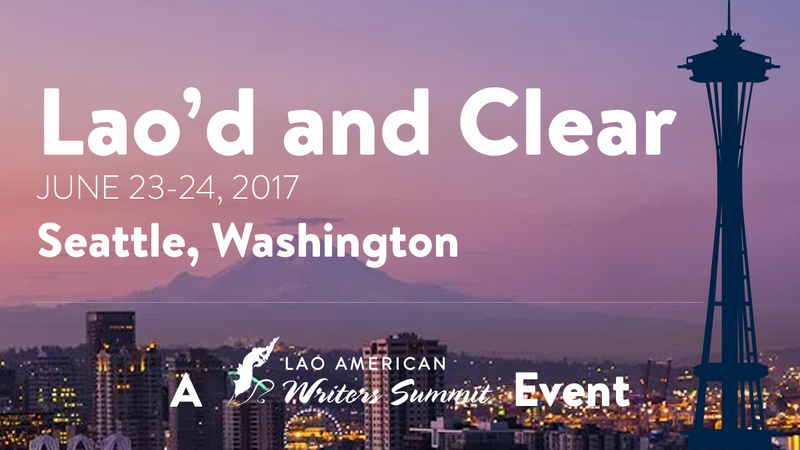 Getting Lao’d and Clear: Team Building Workshop by Latana Jennifer Thaviseth, PhD Student & Nick Khamphilom, UW Husky 100. Cooking With Nana & Friends Luncheon. 1:00 & 2:00 Afternoon Workshops. Each is offered at 1 and 2. 6:30-8:30pm Gallery Reception with Appetizers. Lao’d Remix! 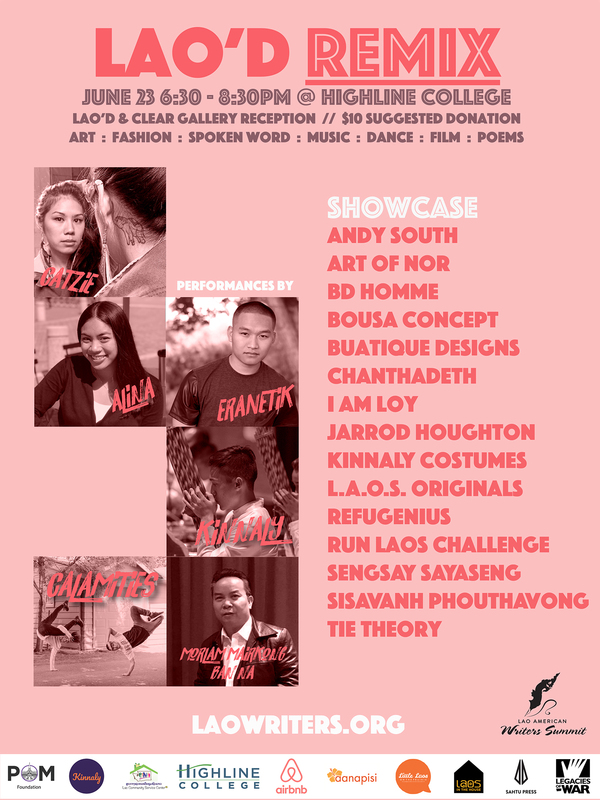 An Evening of Arts, Music, & Dance with a Laotian Remix! 1:30 and 2:30 Afternoon Workshops. Each offered at 1:30 and 2:30. Lao American Writing: From Inspiration to the Page. In this one-hour workshop, Bryan Thao Worra will demonstrate proven creative techniques to overcome writer’s block and put together a 32-page book of poems, short stories, or your memoir to tell your family’s story in new and exciting ways. 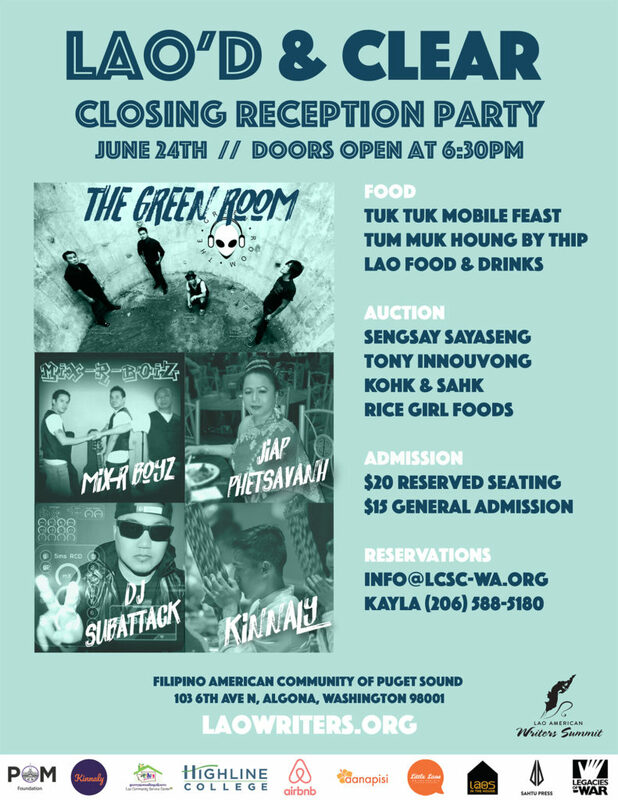 6:30-12:00pm Lao’d and Clear Closing Reception. Admission: $20 reserved seating, $15 general admission. Contact: Kayla 206-588-5180, email: info@LCSC-WA.org. All events will take place at Highline College 2400 S 240th St, Des Moines, WA 98198, with the exception of the Saturday night closing reception. Check out our Venue, Transportation and Lodging page for more helpful information in getting in and around the Seattle and Des Moines area of Washington.